The Restaurant provides clean, hygienic, tasty food at a reasonable price in air-conditioned atmosphere. 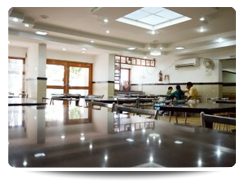 With a seating capacity of 100 members and the caterers are advised to ensure high level of hygiene both at the preparation level as well as the service level. The restaurant has been fully furnished to meet the existing demand and the majority of our customers are mainly from IT companies in and around our industrial estate. Cafe @ atrium was designed as a Light Refreshment stall service to the members and guests.